Took a tape measure with me for my last hike in Indian River Park. Near the center of the park, near the flood plain of the river, there are some massive old growth trees and I was curious how big they were. I clambered through the underbrush to a few of the giants. One had a circumference of 9' 11", the other 11' 3". 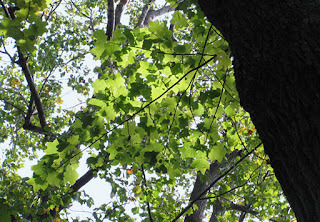 The branches of these two were so high I had difficulty seeing their leafs to make a tree identification. After a lot of neck craning, some zoom photos, and a little research showed that these titans with their deeply furrowed barks are American Tulip Trees. As we walked through the park, more grand old Tulips presented themselves. Some of these trees are almost certainly a century old if not older. Beekeeper acquaintances tell me the the tulip trees are a popular food source for honeybees and results in tasty dark red honey. 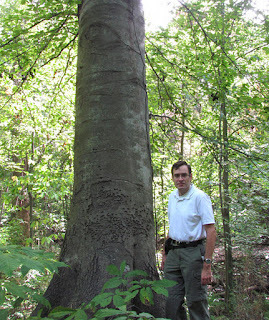 I also came across an American Beech Tree with a circumference of 10' 7". That tree could be anywhere from 100 to more than 200 years old. The beech's nuts are a valuable food source for the forest's raccoons, foxes, rabbits, squirrels. I didn't see too many beech trees in the park. There was a young tree, perhaps a daughter to the old giant, a few yards away. I found a few other mid to large sized trees as I walked the trails. The park has a fairly wide variety of trees from hundreds of Paw Paw saplings in the understory to towering Loblolly Pines, and many other varieties in between; I'll have to start building a more detailed inventory.